It’s 5 o’clock on a Wednesday and you haven’t pulled anything out for dinner. 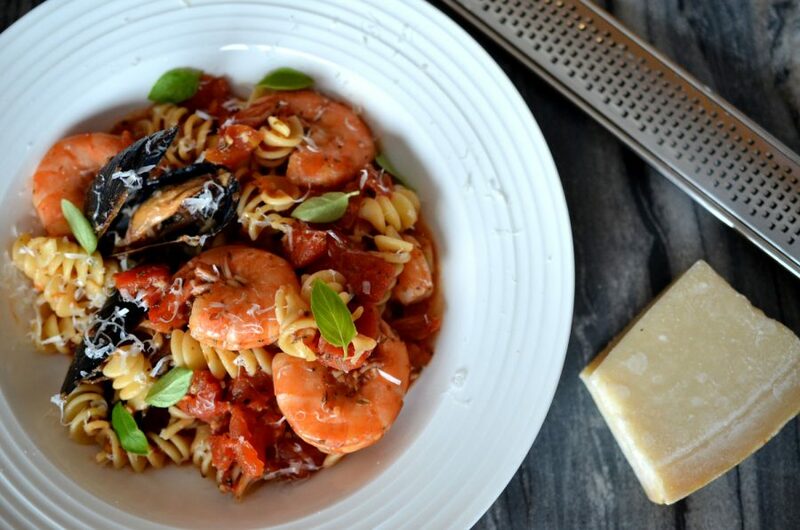 Thankfully, this seafood pasta is easy, quick and flexible enough to suit what you have on hand. I always keep prawns in my freezer, because they are so easy to defrost (for the frequent times I forget to take something out of the freezer), and it is very easy to find mussels at your local grocery store. Don’t like mussels or don’t have them on hand? Try clams, salmon, or even scallops if that’s your fancy. Still don’t like any of those options? Just double the prawns. Turn that boring Wednesday dinner into a fabulous meal in less than half an hour, drop the mic and wait for the applause. In a large saucepan, cook the rotini pasta in a large pot of water. Strain coat with a light drizzle of olive oil (to prevent sticking) and set aside. In a large saucepan, simmer the tomatoes, beer, oregano, paprika, garlic, tomato paste, bay leaf and brown sugar together for 8 – 10 mins to reduce. Once the sauce is the desired consistency, add the shrimp and mussels and cook until the shrimp are fully pink and mussels are opened. Remove from the heat and add to the pasta. Serve immediately.